The Canonet is one of the finest and most overlooked of 35mm rangefinder cameras. Its superb f/1.7 semi-wide angle lens and quiet shutter make it a theatre camera par excellence. 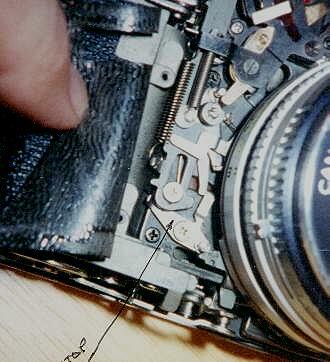 This photo shows the locations of meter and rangefinder adjustments in the Canonet. Loosen the Meter Set Screw and rotate the movement for a linear adjustment; the trim pot on the back adjusts linearity. 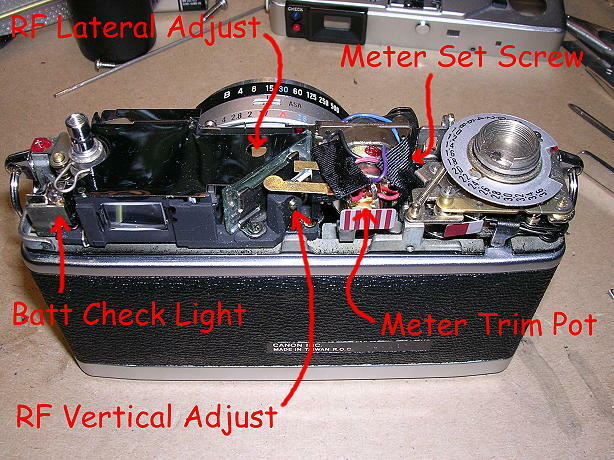 Both mirrors in the rangefinder are fixed, and it works by shifting the negative relay lens fore/aft between them. Both RF adjust screws are accessible from outside the camera, one below the flash shoe and the other behind a round unslotted screw on the back. Not shown on the front of the RF assembly is an eccentric for adjustment of the parallax-correcting framelines.